I ordered filters and mounts from Mavmount over a week ago and never received them. Has anyone recently ordered from them? Any issues?? Yes, they can take a bit of time. It depends on the payment method. The first time I used them, my PayPal went through quickly and they shipped immediately. The 2nd time, for some reason my PayPal payment went through as a check, not sure what happened, and it took 8 days to clear, once cleared, they shipped immediately. You might check your payment see if it's cleared. They are also good at getting back to emails. I put it through as a credit card. I placed my order on the 12th, so maybe they are just slower than normal with processing, but I never received and email indicating that the items I purchased had shipped. Not sure what to do there. You should get an email for sure when they ship. I would try emailing them with the order number and see what they say. If no response after a few days, you might need to call credit card and see if payment went through. Sometimes the card company can make a call or you can contest the order. Hope it gets worked out as they make great stuff. Have their iPad holder for both MPP and MP2. I have had the complete opposite experience with them. I received my mavmount for my 8" tablet and the screw that connects the tablet holder to the plate in the controller mount was stripped. I emailed about it, when they finally replied they blamed me for stripping it, I was more concerned about getting it fixed than assigning blame and replied to them about getting the part to fix it and have never heard back from them. Obviously not impressed with them! In the age of Amazon prime, they do seem prehistoric, albeit realistic. I recently placed an order and it took a week to receive. It felt like an eternity, and yet it was only a week. Without the internet, I would have never known such a part was available. Without the internet, maybe such a part would not be available. Hey there! Thanks for ordering! i just checked and by the date, believe i found your order (Has 'moon' in it, right?). I ship about 20 packages a day, so there's always something that USPS didn't scan on my radar, and a few from that week are not updated yet. On my end I shipped and dropped off quickly, usually same or next day. Everything that has been ordered is shipped except for the few that came in the last hour. correct me if im wrong, but it looks like your tracking is live now, right? 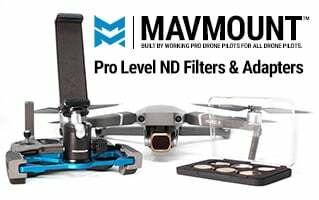 - MavMount.com | ND Filters and Device adapters: Just top quality tools for drone pros and those looking for the best. - AerialWestFilms.com | Professional Drone Pilot; 333 exempt, Part 107, closed set approved. fully insured. I ordered the iPad clamp for my Mavmount on the 17th of this month and USPS still does not provide any confirmation of estimated delivery, it is now the 24th. Listen... I understand the 17th and 18th were a Sunday and a Holiday Monday, but its the 24th. What do you guys think about this? Shouldn't I have received an estimated delivery date? HI there! Yes, sometimes USPS doesn't update, but it doesn't mean its not on it's way usually. looks like it was delivered the day after you posted this. No question about the quality of your product, I am well satisfied and would order through you again, the problem is with the post office (Government inefficiency). I would really like to see you provide an option for either UPS and/or FedEx. True, i really wish USPS would always scan immediately when they get the item. When you drop off 30 packages a day though, it seems they just dont do it sometimes. Lazy.